This article is about the weather phenomenon. A tornado is a violently rotating column of air that is in contact with the base of a cumulonimbus cloud (or occasionally, a cumulus cloud) and the Earth's surface. Tornadoes come in many sizes, but they typically take the form of a visible condensation funnel whose narrow end touches the Earth and is often encircled by a cloud of debris. Most tornadoes have wind speeds of 110 miles per hour (mph) (175 kilometers per hour (km/h)) or less, are approximately 250 feet (75 meters (m)) across, and travel a few miles (several kilometers) before dissipating. Some attain wind speeds of more than 300 mph (480 km/h), stretch more than a mile (1.6 km) across, and stay on the ground for dozens of miles (more than 100 km). Tornadoes have been observed on every continent except Antarctica. Most, however, occur in the United States. They are also common in southern Canada, south-central and eastern Asia, east-central South America, Southern Africa, northwestern and central Europe, Italy, western and southeastern Australia, and New Zealand. A tornado in central Oklahoma. The tornado itself is the thin tube reaching from the cloud to the ground. The lower part of this tornado is surrounded by a translucent dust cloud, kicked up by the tornado's strong winds at the surface. The word "tornado" is an altered form of the Spanish word tronada, which means "thunderstorm." This in turn was taken from the Latin tonare, meaning "to thunder." It most likely reached its present form through a combination of the Spanish tronada and tornar ("to turn"), but this may be a folk etymology. Tornadoes are also commonly referred to as twisters. A tornado near Seymour, Texas. A tornado is defined by the Glossary of Meteorology as "a violently rotating column of air, in contact with the ground, either pendant from a cumuliform cloud or underneath a cumuliform cloud, and often (but not always) visible as a funnel cloud…." A tornado is not necessarily visible; however, the intense low pressure caused by the high wind speeds (see Bernoulli's principle) and rapid rotation (due to cyclostrophic balance) usually causes water vapor in the air to condense into a visible condensation funnel. The tornado is the vortex of wind, not the condensation cloud. A funnel cloud is a visible condensation funnel with no associated strong winds at the surface. Not all funnel clouds evolve into a tornado. However, many tornadoes are preceded by a funnel cloud as the mesocyclonic rotation descends toward the ground. Most tornadoes produce strong winds at the surface while the visible funnel is still above the ground, so it is difficult to tell the difference between a funnel cloud and a tornado from a distance. Occasionally, a single storm produces multiple tornadoes and mesocyclones. This process is known as cyclic tornadogenesis. Tornadoes produced from the same storm are referred to as a tornado family. Sometimes multiple tornadoes from distinct mesocyclones occur simultaneously. Occasionally, several tornadoes are spawned from the same large-scale storm system. If there is no break in activity, this is considered a tornado outbreak, although there are various definitions. A period of several successive days with tornado outbreaks in the same general area (spawned by multiple weather systems) is a tornado outbreak sequence, occasionally called an extended tornado outbreak. A multiple-vortex tornado outside of Dallas, Texas on April 2, 1957. A multiple vortex tornado is a type of tornado in which two or more columns of spinning air rotate around a common center. Multivortex structure can occur in almost any circulation, but is very often observed in intense tornadoes. A satellite tornado is a term for a weaker tornado which forms very near a large, strong tornado contained within the same mesocyclone. The satellite tornado may appear to "orbit" the larger tornado (hence the name), giving the appearance of one, large multi-vortex tornado. However, a satellite tornado is a distinct funnel, and is much smaller than the main funnel. A waterspout near the Florida Keys. A waterspout is officially defined by the US National Weather Service simply as a tornado over water. However, researchers typically distinguish "fair weather" waterspouts from tornadic waterspouts. Fair weather waterspouts are less severe but far more common, and are similar in dynamics to dust devils and landspouts. They form at the bases of cumulus congestus cloud towers in tropical and semitropical waters. They have relatively weak winds, smooth laminar walls, and typically travel very slowly, if at all. They occur most commonly in the Florida Keys. Tornadic waterspouts are more literally "tornadoes over water." They can form over water like mesocyclonic tornadoes, or be a land tornado which crosses onto water. Since they form from severe thunderstorms and can be far more intense, faster, and longer-lived than fair weather waterspouts, they are considered far more dangerous. Landspout is an unofficial term for a tornado not associated with a mesocyclone. The name stems from their characterization as essentially a "fair weather waterspout on land." Waterspouts and landspouts share many defining characteristics, including relative weakness, short lifespan, and a small, smooth condensation funnel which often does not reach the ground. Landspouts also create a distinctively laminar cloud of dust when they make contact with the ground, due to their differing mechanics from true mesoform tornadoes. Though usually weaker than classic tornadoes, they still produce strong winds and may cause serious damage. A gustnado (gust front tornado) is a small, vertical swirl associated with a gust front or downburst. Because they are technically not associated with the cloud base, there is some debate as to whether or not gustnadoes are actually tornadoes. They are formed when fast moving cold, dry outflow air from a thunderstorm is blown through a mass of stationary, warm, moist air near the outflow boundary, resulting in a "rolling" effect (often exemplified through a roll cloud). If low level wind shear is strong enough, the rotation can be turned horizontally (or diagonally) and make contact with the ground. The result is a gustnado. They usually cause small areas of heavier rotational wind damage among areas of straight-line wind damage. It is also worth noting that since they are absent of any Coriolis influence from a mesocyclone, they seem to be alternately cyclonic and anticyclonic without preference. Dust devil in Johnsonville, South Carolina. 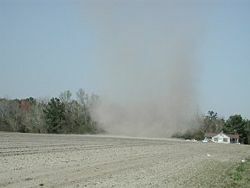 A dust devil resembles a tornado in that it is a vertical swirling column of air. However, they form under clear skies and are rarely as strong as even the weakest tornadoes. They form when a strong convective updraft is formed near the ground on a hot day. If there is enough low level wind shear, the column of hot, rising air can develop a small cyclonic motion that can be seen near the ground. They are not considered tornadoes because they form during fair weather and are not associated with any actual cloud. However, they can, on occasion, result in major damage, especially in arid areas. A winter waterspout, also known as a snow devil or a snowspout, is an extremely rare meteorological phenomenon in which a vortex resembling that of a waterspout forms under the base of a snow squall. Tornado-like circulations occasionally occur near large, intense wildfires and are called fire whirls. They are not considered tornadoes except in the rare case where they connect to a pyrocumulus or other cumuliform cloud above. Fire whirls usually are not as strong as tornadoes associated with thunderstorms. However, they can produce significant damage. A cold air vortex or shear funnel is a tiny, harmless funnel cloud which occasionally forms underneath or on the sides of normal cumuliform clouds, rarely causing any winds at ground-level. Their genesis and mechanics are poorly understood, as they are quite rare, short lived, and hard to spot (due to their non-rotational nature and small size). A wedge tornado, nearly a mile wide. A rope tornado in its dissipating stage. Most tornadoes take on the appearance of a narrow funnel, a few hundred yards (a few hundred meters) across, with a small cloud of debris near the ground. However, tornadoes can appear in many shapes and sizes. Small, relatively weak landspouts may only be visible as a small swirl of dust on the ground. While the condensation funnel may not extend all the way to the ground, if associated surface winds are greater than 40 mph (64 km/h), the circulation is considered a tornado. Large single-vortex tornadoes can look like large wedges stuck into the ground, and so are known as wedge tornadoes or wedges. A wedge can be so wide that it appears to be a block of dark clouds, wider than the distance from the cloud base to the ground. Even experienced storm observers may not be able to tell the difference between a low-hanging cloud and a wedge tornado from a distance. 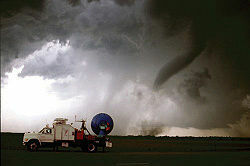 Tornadoes in the dissipating stage can resemble narrow tubes or ropes, and often curl or twist into complex shapes. These tornadoes are said to be roping out, or becoming a rope tornado. Multiple-vortex tornadoes can appear as a family of swirls circling a common center, or may be completely obscured by condensation, dust, and debris, appearing to be a single funnel. In addition to these appearances, tornadoes may be obscured completely by rain or dust. These tornadoes are especially dangerous, as even experienced meteorologists might not spot them. In the United States, on average tornadoes are around 500 feet (150 m) across, and stay on the ground for 5 miles (8 km). Yet, there is an extremely wide range of tornado sizes, even for typical tornadoes. Weak tornadoes, or strong but dissipating tornadoes, can be exceedingly narrow, sometimes only a few feet across. A tornado was once reported to have a damage path only 7 feet (2 m) long. On the other end of the spectrum, wedge tornadoes can have a damage path a mile (1.6 km) wide or more. 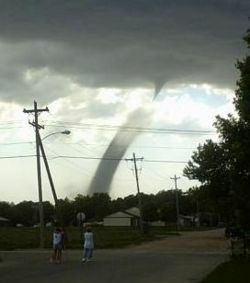 A tornado that affected Hallam, Nebraska on May 22, 2004 was at one point 2.5 miles (4 km) wide at the ground. In terms of path length, the Tri-State Tornado, which affected parts of Missouri, Illinois, and Indiana on March 18, 1925, was officially on the ground continuously for 219 miles (352 km). Many tornadoes which appear to have path lengths of 100 miles or longer are actually a family of tornadoes which have formed in quick succession; however, there is no substantial evidence that this occurred in the case of the Tri-State Tornado. In fact, modern reanalysis of the path suggests that the tornado began 15 miles (24 km) further west than previously thought. Tornadoes can have a wide range of colors, depending on the environment in which they form. Those which form in a dry environment can be nearly invisible, marked only by swirling debris at the base of the funnel. Condensation funnels which pick up little or no debris can be gray to white. 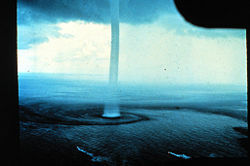 While travelling over a body of water as a waterspout, they can turn very white or even blue. Funnels which move slowly, ingesting a lot of debris and dirt, are usually darker, taking on the color of debris. Tornadoes in the Great Plains can turn red because of the reddish tint of the soil, and tornadoes in mountainous areas can travel over snow-covered ground, turning brilliantly white. Photographs of the Waurika, Oklahoma tornado of May 30, 1976, taken at nearly the same time by two photographers. 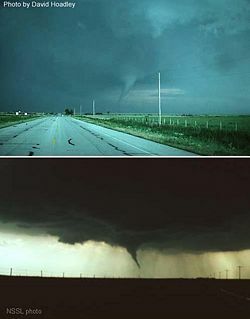 In the top picture, the tornado is front-lit, with the sun behind the east-facing camera, so the funnel appears nearly white. In the lower image, where the camera is facing the opposite direction, the tornado is back-lit, with the sun behind the clouds. Lighting conditions are a major factor in the appearance of a tornado. A tornado which is "back-lit" (viewed with the sun behind it) appears very dark. 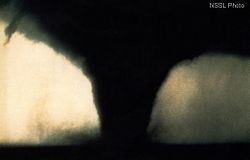 The same tornado, viewed with the sun at the observer's back, may appear gray or brilliant white. Tornadoes which occur near the time of sunset can be many different colors, appearing in hues of yellow, orange, and pink. Dust kicked up by the winds of the parent thunderstorm, heavy rain and hail, and the darkness of night are all factors which can reduce the visibility of tornadoes. Tornadoes occurring in these conditions are especially dangerous, since only radar observations, or possibly the sound of an approaching tornado, serve as any warning to those in the storm's path. Fortunately most significant tornadoes form under the storm's rain-free base, or the area under the thunderstorm's updraft, where there is little or no rain. In addition, most tornadoes occur in the late afternoon, when the bright sun can penetrate even the thickest clouds. Also, night-time tornadoes are often illuminated by frequent lightning. There is mounting evidence, including Doppler On Wheels mobile radar images and eyewitness accounts, that most tornadoes have a clear, calm center with extremely low pressure, akin to the eye of tropical cyclones. This area would be clear (possibly full of dust), have relatively light winds, and be very dark, since the light would be blocked by swirling debris on the outside of the tornado. Lightning is said to be the source of illumination for those who claim to have seen the interior of a tornado. Tornadoes normally rotate cyclonically in direction (counterclockwise in the northern hemisphere, clockwise in the southern). While large-scale storms always rotate cyclonically due to the Coriolis effect, thunderstorms and tornadoes are so small that the direct influence of Coriolis effect is inconsequential, as indicated by their large Rossby numbers. Supercells and tornadoes rotate cyclonically in numerical simulations even when the Coriolis effect is neglected. Low-level mesocyclones and tornadoes owe their rotation to complex processes within the supercell and ambient environment. Approximately one percent of tornadoes rotate in an anticyclonic direction. Typically, only landspouts and gustnados rotate anticyclonically, and usually only those which form on the anticyclonic shear side of the descending rear flank downdraft in a cyclonic supercell. 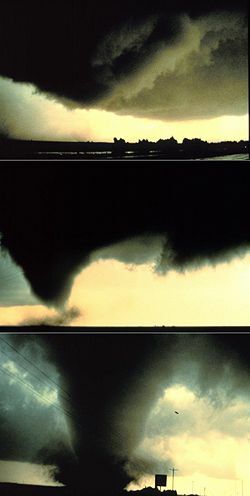 However, on rare occasions, anticyclonic tornadoes form in association with the mesoanticyclone of an anticyclonic supercell, in the same manner as the typical cyclonic tornado, or as a companion tornado—either as a satellite tornado or associated with anticyclonic eddies within a supercell. Tornadoes emit widely on the acoustics spectrum and the sounds are cased by multiple mechanisms. 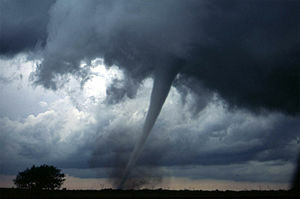 Various sounds of tornadoes have been reported throughout time, mostly related to familiar sounds for the witness and generally some variation of a whooshing roar. Popularly reported sounds include a freight train, rushing rapids or waterfall, a jet engine from close proximity, or combinations of these. Many tornadoes are not audible from much distance; the nature and propagation distance of the audible sound depends on atmospheric conditions and topography. The winds of the tornado vortex and of constituent turbulent eddies, as well as airflow interaction with the surface and debris, contribute to the sounds. Funnel clouds also produce sounds. Funnel clouds and small tornadoes are reported as whistling, whining, humming, or the buzzing of innumerable bees or electricity, or more or less harmonic, whereas many tornadoes are reported as a continuous, deep rumbling, or an irregular sound of “noise”. Since many tornadoes are audible only in very close proximity, sound is not reliable warning of a tornado. And, any strong, damaging wind, even a severe hail volley or continuous thunder in a thunderstorm may produce a roaring sound. An illustration of generation of infrasound in tornadoes by the Earth System Research Laboratory's Infrasound Program. Tornadoes also produce identifiable inaudible infrasonic signatures. 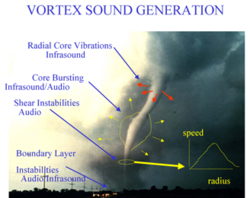 Unlike audible signatures, tornadic signatures have been isolated; due to the long distance propagation of low-frequency sound, efforts are ongoing to develop tornado prediction and detection devices with additional value in understanding tornado morphology, dynamics, and creation. Tornadoes also produce a detectable seismic signature, and research continues on isolating it and understanding the process. Tornadoes emit on the electromagnetic spectrum, for example, with sferics and E-field effects detected. The effects vary, mostly with little observed consistency. Correlations with patterns of lightning activity have also been observed, but little in way of consistent correlations have been advanced. Tornadic storms do not contain more lightning than other storms, and some tornadic cells never contain lightning. More often than not, overall cloud-to-ground (CG) lightning activity decreases as a tornado reaches the surface and returns to the baseline level when the tornado lifts. In many cases, very intense tornadoes and thunderstorms exhibit an increased and anomalous dominance in positive polarity CG discharges. Electromagnetics and lightning have little to nothing to do directly with what drives tornadoes (tornadoes are basically a thermodynamic phenomenon), though there are likely connections with the storm and environment affecting both phenomena. Luminosity has been reported in the past, and is probably due to misidentification of external light sources such as lightning, city lights, and power flashes from broken lines, as internal sources are now uncommonly reported and are not known to ever been recorded. In addition to winds, tornadoes also exhibit changes in atmospheric variables such as temperature, moisture, and pressure. For example, on June 24, 2003 near Manchester, South Dakota, a probe measured a 100 mb (hPa) (2.95 inHg) pressure deficit. The pressure dropped gradually as the vortex approached then dropped extremely rapidly to 850 mb (hPa) (25.10 inHg) in the core of the violent tornado before rising rapidly as the vortex moved away, resulting in a V-shape pressure trace. Temperature tends to decrease and moisture content to increase in the immediate vicinity of a tornado. A sequence of images showing the birth of a tornado. First, the rotating cloud base lowers. This lowering becomes a funnel, which continues descending while winds build near the surface, kicking up dust and other debris. Finally, the visible funnel extends to the ground, and the tornado begins causing major damage. This tornado, near Dimmitt, Texas, was one of the best-observed violent tornadoes in history. Tornadoes often develop from a class of thunderstorms known as supercells. Supercells contain mesocyclones, an area of organized rotation a few miles up in the atmosphere, usually 1–6 miles (2–10 km) across. Most intense tornadoes (EF3 to EF5 on the Enhanced Fujita Scale) develop from supercells. In addition to tornadoes, very heavy rain, frequent lightning, strong wind gusts, and hail are common in such storms. Most tornadoes from supercells follow a recognizable life cycle. That begins when increasing rainfall drags with it an area of quickly descending air known as the rear flank downdraft (RFD). This downdraft accelerates as it approaches the ground, and drags the supercell's rotating mesocyclone towards the ground with it. 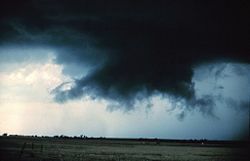 As the mesocyclone approaches the ground, a visible condensation funnel appears to descend from the base of the storm, often from a rotating wall cloud. As the funnel descends, the RFD also reaches the ground, creating a gust front that can cause damage a good distance from the tornado. Usually, the funnel cloud becomes a tornado within minutes of the RFD reaching the ground. Initially, the tornado has a good source of warm, moist inflow to power it, so it grows until it reaches the mature stage. This can last anywhere from a few minutes to more than an hour, and during it a tornado often causes the most damage, and in rare cases can be more than one mile across. Meanwhile, the RFD, now an area of cool surface winds, begins to wrap around the tornado, cutting off the inflow of warm air which feeds the tornado. As the RFD completely wraps around and chokes off the tornado's air supply, the vortex begins to weaken, and become thin and rope-like. This is the dissipating stage; often lasting no more than a few minutes, after which the tornado fizzles. During this stage the shape of the tornado becomes highly influenced by the winds of the parent storm, and can be blown into fantastic patterns. As the tornado enters the dissipating stage, its associated mesocyclone often weakens as well, as the rear flank downdraft cuts off the inflow powering it. In particularly intense supercells tornadoes can develop cyclically. As the first mesocyclone and associated tornado dissipate, the storm's inflow may be concentrated into a new area closer to the center of the storm. If a new mesocyclone develops, the cycle may start again, producing one or more new tornadoes. Occasionally, the old (occluded) mesocyclone and the new mesocyclone produce a tornado at the same time. Though this is a widely-accepted theory for how most tornadoes form, live, and die, it does not explain the formation of smaller tornadoes, such as landspouts, long-lived tornadoes, or tornadoes with multiple vortices. These each have different mechanisms which influence their development—however, most tornadoes follow a pattern similar to this one. 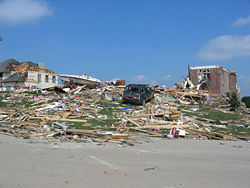 An example of EF3 damage. Here, the roof and some inner walls of this brick building have been demolished. The Fujita scale and the Enhanced Fujita Scale rate tornadoes by damage caused. The Enhanced Fujita Scale was an upgrade to the older Fujita scale, with engineered (by expert elicitation) wind estimates and better damage descriptions, but was designed so that a tornado rated on the Fujita scale would receive the same numerical rating. An EF0 tornado will likely damage trees but not substantial structures, whereas an EF5 tornado can rip buildings off their foundations leaving them bare and even deform large skyscrapers. The similar TORRO scale ranges from a T0 for extremely weak tornadoes to T11 for the most powerful known tornadoes. Radar data, photogrammetry, and ground swirl patterns (cycloidal marks) may also be analyzed to determine intensity and award a rating. Tornadoes vary in intensity regardless of shape, size, and location, though strong tornadoes are typically larger than weak tornadoes. The association with track length and duration also varies, although longer track tornadoes tend to be stronger. In the case of violent tornadoes, only a small portion of the path is of violent intensity, most of the higher intensity from subvortices. In the United States, 80 percent of tornadoes are EF0 and EF1 (T0 through T3) tornadoes. The rate of occurrence drops off quickly with increasing strength—less than one percent are violent tornadoes, stronger than EF4, T8. Outside the United States, areas in south-central Asia, and perhaps portions of southeastern South America and southern Africa, violent tornadoes are extremely rare. This is apparently mostly due to the lesser number of tornadoes overall, as research shows that tornado intensity distributions are fairly similar worldwide. A few significant tornadoes occur annually in Europe, Asia, southern Africa, and southeastern South America, respectively. Areas worldwide where tornadoes are most likely, indicated by orange shading. Intense tornado activity in the United States. The darker-colored areas denote the area commonly referred to as Tornado Alley. The United States has the most tornadoes of any country, about four times more than estimated in all of Europe, not including waterspouts. This is mostly due to the unique geography of the continent. North America is a relatively large continent that extends from the tropical south into arctic areas, and has no major east-west mountain range to block air flow between these two areas. In the middle latitudes, where most tornadoes of the world occur, the Rocky Mountains block moisture and atmospheric flow, allowing drier air at mid-levels of the troposphere, and causing cyclogenesis downstream to the east of the mountains. The desert Southwest also feeds drier air and the dry line, while the Gulf of Mexico fuels abundant low-level moisture. This unique topography allows for many collisions of warm and cold air, the conditions that breed strong, long-lived storms many times a year. A large portion of these tornadoes form in an area of the central United States known as Tornado Alley. This area extends into Canada, particularly Ontario and the Prairie Provinces. Strong tornadoes also occasionally occur in northern Mexico. The United States averages about 1200 tornadoes per year. The Netherlands has the highest average number of recorded tornadoes per area of any country (more than 20, or 0.0013 per sq mi (0.00048 per km²), annually), followed by the UK (around 33, or 0.00035 per sq mi (0.00013 per km²), per year), but most are small and cause minor damage. In absolute number of events, ignoring area, the UK experiences more tornadoes than any other European country, excluding waterspouts. Bangladesh and surrounding areas of eastern India suffer from tornadoes of equal severity to those in the US with more regularity than any other region in the world, but these tend to be under-reported due to the scarcity of media coverage in third-world countries. They kill about 179 people per year in Bangladesh, much more than in the US. This is likely due to the density of population, poor quality of construction, lack of tornado safety knowledge, and other factors. Other areas of the world that have frequent tornadoes include South Africa, parts of Argentina, Paraguay, and southern Brazil, as well as portions of Europe, Australia and New Zealand, and far eastern Asia.ref name="EB tornado climatology"/> Tornadoes are most common in spring and least common in winter. Since autumn and spring are transitional periods (warm to cool and vice versa) there are more chances of cooler air meeting with warmer air, resulting in thunderstorms. Tornadoes can also be caused by landfalling tropical cyclones, which tend to occur in the late summer and autumn. But favorable conditions can occur at any time of the year. Tornado occurrence is highly dependent on the time of day, because of solar heating. Worldwide, most tornadoes occur in the late afternoon, between 3 and 7 P.M. local time, with a peak near 5 P.M. However, destructive tornadoes can occur at any time of day. The Gainesville Tornado of 1936, one of the deadliest tornadoes in history, occurred at 8:30 A.M. local time. Probabilistic maps issued by the Storm Prediction Center during the heart of the April 6-8, 2006 Tornado Outbreak. The top map indicates the risk of general severe weather (including large hail, damaging winds, and tornadoes), while the bottom map specifically shows the percent risk of a tornado forming within 25 miles (40 km) of any point within the enclosed area. The hashed area on the bottom map indicates a 10 percent or greater risk of an F2 or stronger tornado forming within 25 miles (40 km) of a point. Weather forecasting is handled regionally by many national and international agencies. For the most part, they are also in charge of the prediction of conditions conducive to tornado development. Severe thunderstorm warnings are provided to Australia by the Bureau of Meteorology. The country is in the middle of an upgrade to Doppler radar systems, with their first benchmark of installing six new radars reached in July 2006. The European Union founded a project in 2002 called the European Severe Storms virtual Laboratory, or ESSL, which is meant to fully document tornado occurrence across the continent. The ESTOFEX (European Storm Forecast Experiment) arm of the project also issues one day forecasts for severe weather likelihood. In Germany, Austria, and Switzerland, an organization known as TorDACH collects information regarding tornadoes, waterspouts, and downbursts from Germany, Austria, and Switzerland. A secondary goal is collect all severe weather information. This project is meant to fully document severe weather activity in these three countries. In the United Kingdom, the Tornado and Storm Research Organisation (TORRO) makes experimental predictions. The Met Office provides official forecasts for the UK. In the United States, generalized severe weather predictions are issued by the Storm Prediction Center, based in Norman, Oklahoma. For the next one, two, and three days, respectively, they will issue categorical and probabilistic forecasts of severe weather, including tornadoes. There is also a more general forecast issued for the four to eight day period. Just prior to the expected onset of an organized severe weather threat, SPC issues severe thunderstorm and tornado watches, in collaboration with local National Weather Service offices. Warnings are issued by local National Weather Service offices when a severe thunderstorm or tornado is occurring or imminent. In Japan, predictions and study of tornadoes in Japan are handled by the Japan Meteorological Agency. In Canada, weather forecasts and warnings, including tornadoes, are produced by the Meteorological Service of Canada, a division of Environment Canada. A Doppler radar image indicating the likely presence of a tornado over DeLand, Florida. Green colors indicate areas where the precipitation is moving towards the radar dish, while red areas are moving away. In this case the radar is in the bottom right corner of the image. Strong mesocyclones show up as adjacent areas of bright green and bright red, and usually indicate an imminent or occurring tornado. Rigorous attempts to warn of tornadoes began in the United States in the mid-twentieth century. Before the 1950s, the only method of detecting a tornado was by someone seeing it on the ground. Often, news of a tornado would reach a local weather office after the storm. But, with the advent of weather radar, areas near a local office could get advance warning of severe weather. The first public tornado warnings were issued in 1950 and the first tornado watches and convective outlooks in 1952. In 1953 it was confirmed that hook echoes are associated with tornadoes. By recognizing these radar signatures, meteorologists could detect thunderstorms likely producing tornadoes from dozens of miles away. In the mid 1970s, the US National Weather Service (NWS) increased its efforts to train storm spotters to spot key features of storms which indicate severe hail, damaging winds, and tornadoes, as well as damage itself and flash flooding. The program was called Skywarn, and the spotters were local sheriff's deputies, state troopers, firefighters, ambulance drivers, amateur radio operators, civil defense (now emergency management) spotters, storm chasers, and ordinary citizens. When severe weather is anticipated, local weather service offices request that these spotters look out for severe weather, and report any tornadoes immediately, so that the office can issue a timely warning. Usually spotters are trained by the NWS on behalf of their respective organizations, and report to them. The organizations activate public warning systems such as sirens and the Emergency Alert System, and forward the report to the NWS. There are more than 230,000 trained Skywarn weather spotters across the United States. In Canada, a similar network of volunteer weather watchers, called Canwarn, helps spot severe weather, with more than 1000 volunteers. In Europe, several nations are organizing spotter networks under the auspices of Skywarn Europe and the Tornado and Storm Research Organisation (TORRO) has maintained a network of spotters in the United Kingdom since the 1970s. Storm spotters are needed because radar systems such as NEXRAD do not detect a tornado; only indications of one. Radar may give a warning before there is any visual evidence of a tornado or imminent tornado, but ground truth from an observer can either verify the threat or determine that a tornado is not imminent. The spotter's ability to see what radar cannot is especially important as distance from the radar site increases, because the radar beam becomes progressively higher in altitude further away from the radar, chiefly due to curvature of Earth, and the beam also spreads out. Therefore, when far from a radar, only high in the storm is observed and the important areas are not sampled, and data resolution also suffers. Also, some meteorological situations leading to tornadogenesis are not readily detectable by radar and on occasion tornado development may occur more quickly than radar can complete a scan and send the batch of data. A rotating wall cloud with rear flank downdraft clear slot evident to its left rear. Storm spotters are trained to discern whether a storm seen from a distance is a supercell. They typically look to its rear, the main region of updraft and inflow. Under the updraft is a rain-free base, and the next step of tornadogenesis is the formation of a rotating wall cloud. The vast majority of intense tornadoes occur with a wall cloud on the backside of a supercell. Evidence of a supercell comes from the storm's shape and structure, and cloud tower features such as a hard and vigorous updraft tower, a persistent, large overshooting top, a hard anvil (especially when backsheared against strong upper level winds), and a corkscrew look or striations. Under the storm and closer to where most tornadoes are found, evidence of a supercell and likelihood of a tornado includes inflow bands (particularly when curved) such as a "beaver tail," and other clues such as strength of inflow, warmth and moistness of inflow air, how outflow- or inflow-dominant a storm appears, and how far is the front flank precipitation core from the wall cloud. Tornadogenesis is most likely at the interface of the updraft and front flank downdraft, and requires a balance between the outflow and inflow. Only wall clouds that rotate spawn tornadoes, and usually precede the tornado by five to thirty minutes. Rotating wall clouds are the visual manifestation of a mesocyclone. Barring a low-level boundary, tornadogenesis is highly unlikely unless a rear flank downdraft occurs, which is usually visibly evidenced by evaporation of cloud adjacent to a corner of a wall cloud. 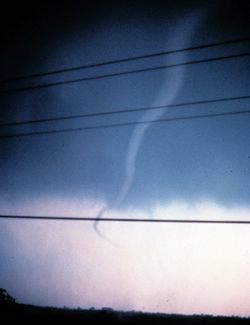 A tornado often occurs as this happens or shortly after; first, a funnel cloud dips and in nearly all cases by the time it reaches halfway down, a surface swirl has already developed, signifying a tornado is on the ground before condensation connects the surface circulation to the storm. Tornadoes may also occur without wall clouds, under flanking lines, and on the leading edge. Spotters watch all areas of a storm, and the cloud base and surface. Today, most developed countries have a network of weather radars, which remains the main method of detecting signatures likely associated with tornadoes. In the United States and a few other countries, Doppler radar stations are used. These devices measure the velocity and radial direction (towards or away from the radar) of the winds in a storm, and so can spot evidence of rotation in storms from more than a hundred miles away. Also, most populated areas on Earth are now visible from the Geostationary Operational Environmental Satellites (GOES), which aid in the nowcasting of tornadic storms. The most extreme tornado in recorded history was the Tri-State Tornado which roared through parts of Missouri, Illinois, and Indiana on March 18, 1925. It was likely an F5, though tornadoes were not ranked on any scale in that era. It holds records for longest path length (219 miles, 352 km), longest duration (about 3.5 hours), and fastest forward speed for a significant tornado (73 mph, 117 km/h) anywhere on earth. In addition, it is the deadliest single tornado in United States history (695 dead). It was also the second costliest tornado in history at the time, but has been surpassed by several others non-normalized. When costs are normalized for wealth and inflation, it still ranks third today. The deadliest tornado in world history was the Daultipur-Salturia Tornado in Bangladesh on April 26, 1989, killing approximately 1300 people. A map of the tornado paths in the Super Outbreak. 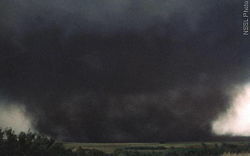 The most extensive tornado outbreak on record, in almost every category, was the Super Outbreak, which affected a large area of the central United States and extreme southern Ontario in Canada on April 3 and April 4, 1974. Not only did this outbreak feature an incredible 148 tornadoes in only 18 hours, but an unprecedented number of them were violent; six were of F5 intensity, and twenty-four F4. This outbreak had a staggering sixteen tornadoes on the ground at the same time at the peak of the outbreak. More than 300 people, possibly as many as 330, were killed by tornadoes during this outbreak. While it is nearly impossible to directly measure the most violent tornado wind speeds (conventional anemometers would be destroyed by the intense winds), some tornadoes have been scanned by mobile Doppler radar units, which can provide a good estimate of the tornado's winds. The highest wind speed ever measured in a tornado, which is also the highest wind speed ever recorded on the planet, is 301 ± 20 mph (484 ± 32 km/h) in the F5 Moore, Oklahoma tornado. Though the reading was taken about 100 feet (30 m) above the ground, this is a testament to the power of the strongest tornadoes. Storms which produce tornadoes can feature intense updrafts (sometimes exceeding 150 mph, 240 km/h). Debris from a tornado can be lofted into the parent storm and carried a very long distance. A tornado which affected Great Bend, Kansas in November, 1915 was an extreme case, where a "rain of debris" occurred 80 miles (130 km) from the town, a sack of flour was found 110 miles (177 km) away, and a cancelled check from the Great Bend bank was found in a field outside of Palmyra, Nebraska, 305 miles (491 km) to the northeast. Though tornadoes can strike in an instant, there are precautions and preventative measures that people can take to increase the chances of surviving a tornado. Authorities such as the Storm Prediction Center advise having a tornado plan. When a tornado warning is issued, going to a basement or an interior first-floor room of a sturdy building greatly increases chances of survival. In tornado-prone areas, many buildings have storm cellars on the property. These underground refuges have saved thousands of lives. Some countries have meteorological agencies which distribute tornado forecasts and increase levels of alert of a possible tornado (such as tornado watches and warnings in the United States and Canada). Weather radios provide an alarm when a severe weather advisory is issued for the local area, though these are mainly available only in the United States. Unless the tornado is far away and highly visible, meteorologists advise that drivers park their vehicles far to the side of the road (so as not to block emergency traffic), and find a sturdy shelter. If no sturdy shelter is nearby, getting low in a ditch is the next best option. Highway overpasses are extremely bad shelter during tornadoes (see next section). 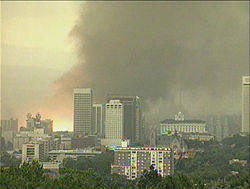 Salt Lake City Tornado, August 11, 1999. This tornado disproved several myths, including the idea that tornadoes cannot occur in areas like Utah. One of the most persistent myths associated with tornadoes is that opening windows will lessen the damage caused by the tornado. While there is a large drop in atmospheric pressure inside a strong tornado, it is unlikely that the pressure drop would be enough to cause the house to explode. Some research indicates that opening windows may actually increase the severity of the tornado's damage. Regardless of the validity of the explosion claim, time would be better spent seeking shelter before a tornado than opening windows. A violent tornado can destroy a house whether its windows are open or closed. Another commonly held belief is that highway overpasses provide adequate shelter from tornadoes. On the contrary, a highway overpass is a dangerous place during a tornado. In the Oklahoma Tornado Outbreak of May 3, 1999, three highway overpasses were directly struck by tornadoes, and at all three locations there was a fatality, along with many life-threatening injuries. The small area under the overpasses created a kind of wind tunnel, increasing the wind's speed, making the situation worse. By comparison, during the same tornado outbreak, more than 2000 homes were completely destroyed, with another 7000 damaged, and yet only a few dozen people died in their homes. An old belief is that the southwest corner of a basement provides the most protection during a tornado. The safest place is the side or corner of an underground room opposite the tornado's direction of approach (usually the northeast corner), or the central-most room on the lowest floor. Taking shelter under a sturdy table, in a basement, or under a staircase increases chances of survival even more. Finally, there are areas which people believe to be protected from tornadoes, whether by a major river, a hill or mountain, or even protected by "spirits." Tornadoes have been known to cross major rivers, climb mountains, and affect valleys. As a general rule, no area is "safe" from tornadoes, though some areas are more susceptible than others. (See Tornado climatology). A Doppler On Wheels unit observing a tornado near the town of Attica, Kansas. Meteorology is a relatively young science and the study of tornadoes even more so. Although studied for about 140 years and intensively for around 60 years, there are still aspects of tornadoes which remain a mystery. Scientists do have a fairly good idea of the development of thunderstorms and mesocyclones, and the meteorological conditions conducive to their formation; however, the step from supercell (or other respective formative processes) to tornadogenesis and predicting tornadic vs. non-tornadic mesocyclones is not yet well understood and is the focus of much research. Also under study are the low-level mesocyclone and the stretching of low-level vorticity which tightens into a tornado, namely, what are the processes and what is the relationship of the environment and the convective storm. Intense tornadoes have been observed forming simultaneously with a mesocyclone aloft (rather than succeeding mesocyclogenesis) and some intense tornadoes have occurred without a mid-level mesocyclone. In particular, the role of downdrafts, particularly the rear-flank downdraft, and the role of baroclinic boundaries, are intense areas of study. Reliably predicting tornado intensity and longevity remains a problem, as do details affecting characteristics of a tornado during its life cycle and tornadolysis. Other rich areas of research are tornadoes associated with mesovortices within linear thunderstorm structures and within tropical cyclones. Scientists still do not know the exact mechanisms by which most tornadoes form, and occasional tornadoes still strike without a tornado warning being issued, especially in under-developed countries. Analysis of observations including both stationary and mobile (surface and aerial) in-situ and remote sensing (passive and active) instruments generates new ideas and refines existing notions. Numerical modeling also provides new insights as observations and new discoveries are integrated into our physical understanding and then tested in computer simulations which validate new notions as well as produce entirely new theoretical findings, many of which are otherwise unattainable. Importantly, development of new observation technologies and installation of finer spatial and temporal resolution observation networks have aided increased understanding and better predictions. Research programs, including field projects such as VORTEX, deployment of TOTO (the TOtable Tornado Observatory), Doppler On Wheels (DOW), and dozens of other programs, hope to solve many questions that still plague meteorologists. Universities, government agencies such as the National Severe Storms Laboratory, private-sector meteorologists, and the National Center for Atmospheric Research are some of the organizations very active in research; with various sources of funding, both private and public, a chief entity being the National Science Foundation. ↑ 1.0 1.1 Doppler On Wheels. Center for Severe Weather Research. Retrieved August 19, 2007. ↑ 2.0 2.1 Hallam Nebraska Tornado. Omaha/Valley, NE Weather Forecast Office. Retrieved August 19, 2007. ↑ 3.0 3.1 3.2 3.3 3.4 Roger Edwards, 2006. The Online Tornado FAQ. Storm Prediction Center. Retrieved August 19, 2007. ↑ 4.0 4.1 4.2 Sid Perkins, 2002. Tornado Alley, USA. Science News, 296–298. Retrieved August 19, 2007. ↑ Encyclopædia Britannica. Tornado: Global occurrence. Retrieved August 19, 2007. ↑ Douglas Harper, 2001. Online Etymology Dictionary. Retrieved August 19, 2007. ↑ 1993. Merriam Webster's Collegiate Dictionary, 10th Ed. (Springfield, MA: Merriam-Webster, Incorporated. ISBN 0877797099). Retrieved August 19, 2007. ↑ 8.0 8.1 1999. The Tornado Project's Terrific, Timeless and Sometimes Trivial Truths about Those Terrifying Twirling Twisters! The Tornado Project. Retrieved August 21, 2007. ↑ 9.0 9.1 Glossary of Meteorology, Second Edition. American Meteorological Society. Retrieved August 19, 2007. ↑ Michael Branick, 2006. A Comprehensive Glossary of Weather Terms for Storm Spotters. NOAA. Retrieved August 19, 2007. ↑ 11.0 11.1 11.2 11.3 11.4 11.5 11.6 11.7 11.8 Thomas P. Grazulis, 1993. Significant Tornadoes 1680–1991. (St. Johnsbury, VT: The Tornado Project of Environmental Films. ISBN 1879362031). ↑ Russell S. Schneider, Harold E. Brooks, and Joseph T. Schaefer. 2004. 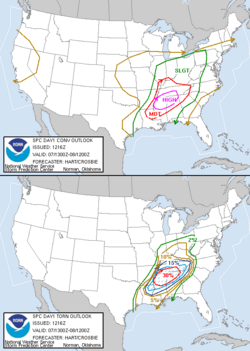 Tornado Outbreak Day Sequences: Historic Events and Climatology (1875–2003). Retrieved August 19, 2007. ↑ 13.0 13.1 13.2 Dave Zittel, 2000. Tornado Chase 2000. USA Today. Retrieved August 19, 2007. ↑ Joseph Golden, Waterspouts are tornadoes over water. USA Today. Retrieved August 21, 2007. ↑ 15.0 15.1 15.2 15.3 Doswell, Moller, Anderson et al. 2005. Advanced Spotters' Field Guide. US Department of Commerce. Retrieved August 21, 2007. ↑ Gustnado. American Meteorological Society. Retrieved August 21, 2007. ↑ 17.0 17.1 17.2 17.3 17.4 17.5 Walter A. Lyons, 1997. The Handy Weather Answer Book. (Detroit, MI: Visible Ink press. ISBN 0787610348). ↑ Charles H. Jones and Charlie A. Liles. 1999. Severe Weather Climatology for New Mexico. Retrieved August 21, 2007. ↑ Phil Schumacher, 2005. FAQ's of Summer Weather. National Weather Service, Sioux Falls, South Dakota. Retrieved August 21, 2007. ↑ Roger Edwards, Wedge Tornado. National Weather Service Storm Prediction Center. Retrieved August 21, 2007. ↑ Roger Edwards, Rope Tornado. National Weather Service Storm Prediction Center. Retrieved August 21, 2007. ↑ Charles A. Doswell, III. The Tri-State Tornado of 18 March 1925 Reanalysis Project. Retrieved August 21, 2007. ↑ 23.0 23.1 Roger Edwards, Public Domain Tornado Images. National Severe Storms Laboratory. Retrieved August 21, 2007. ↑ 24.0 24.1 Lloyd Mercer and Linda Mercer. 1996. Target: Tornado. The Weather Channel (United States). ↑ R. Monastersky, 1999. Oklahoma Tornado Sets Wind Record. Science News. Retrieved August 21, 2007. ↑ Alonzo A. Justice, 1930. Seeing the Inside of a Tornado. Monthly Weather Review. American Meteorological Society. Retrieved August 21, 2007. ↑ Roy S. Hall. 2003. Tornadoes. (Farmington Hills, MI: Greenhaven Press. ISBN 0737714735). ↑ Robert Davies-Jones, 1984. Journal of the Atmospheric Sciences 41(20):2991–3006. Streamwise Vorticity: The Origin of Updraft Rotation in Supercell Storms. American Meteorological Society. Retrieved August 21, 2007. ↑ Richard Rotunno, Joseph Klemp. 1985.Journal of the Atmospheric Sciences 42(3) :271–292. the Rotation and Propagation of Simulated Supercell Thunderstorms. American Meteorological Society. Retrieved August 21, 2007. ↑ Louis J. Wicker, Robert B. Wilhelmson. 1995. Journal of the Atmospheric Sciences 52(15):2675–2703. Simulation and Analysis of Tornado Development and Decay within a Three-Dimensional Supercell Thunderstorm. American Meteorological Society. Retrieved August 21, 2007. ↑ Greg Forbes, weather.com - Blog: The Weather Channel on weather news, hurricanes, tornadoes & meteorology. Retrieved August 21, 2007. ↑ John Moteverdi, 2003. Sunnyvale and Los Altos, CA Tornadoes May 4, 1998. Retrieved August 21, 2007. ↑ Abdul Abdullah, Monthly Weather Review 94(4):213–220. The "Musical" Sound Emitted by a Tornado". American Meteorological Society. Retrieved August 21, 2007. ↑ David Hoadley, 1983. Tornado Sound Experiences. Stormtrack. 6(3):5-9. Retrieved August 21, 2007. ↑ A. J. Bedard, 2005. Monthly Weather Review 133(1):241–263. Low-Frequency Atmospheric Acoustic Energy Associated with Vortices Produced by Thunderstorms. American Meteorological Society. Retrieved August 21, 2007. ↑ 36.0 36.1 36.2 Howard Bluestein, 1999. A History of Severe-Storm-Intercept Field Programs. American Meteorological Society. Weather and Forecasting. 14(4):558–577. Retrieved August 21, 2007. ↑ Frank Tatom, Kevin R. Knupp, and Stanley J. Vitto. 1995. Journal of Applied Meteorology 34(2):572–582. Tornado Detection Based on Seismic Signal. American Meteorological Society. Retrieved August 21, 2007. ↑ Antony H. Perez, Louis J. Wicker, and Richard E. Orville. 1997. Characteristics of Cloud-to-Ground Lightning Associated with Violent Tornadoes. Weather and Forecasting. 12(3):428-437. Retrieved August 21, 2007. ↑ Julian J. Lee, Timothy P. Samaras and Carl R. Young. 2004. Measurements at the ground in an F-4 tornado. Preprints of the 22nd Conference on Severe Local Storms. (Hyannis, MA: American Meteorological Society). Retrieved August 22, 2007. ↑ Straka Markowski, and Rasmussen. 2002. Tornadogenesis Resulting from the Transport of Circulation by a Downdraft: Idealized Numerical Simulations. Journal of the Atmospheric Sciences 60(6):28. Retrieved August 22, 2007. ↑ Harold E. Brooks, 2004. On the Relationship of Tornado Path Length and Width to Intensity. Weather and Forecasting. 19(2):310–319. Retrieved August 22, 2007. ↑ 43.0 43.1 Edwards, Moller, Purpura et al. 2005. Basic Spotters’ Field Guide. US Department of Commerce, National Weather Service. Retrieved August 22, 2007. ↑ Nikolai Dotzek, Jürgen Grieser, Harold E. Brooks. 2003. Statistical modeling of tornado intensity distributions. Atmospheric Research. Retrieved August 22, 2007. ↑ 45.0 45.1 Nikolai Dotzek, 2003. An updated estimate of tornado occurrence in Europe. Atmospheric Research. Retrieved August 22, 2007. ↑ 46.0 46.1 Bhuiyan Paul, 2004. The April 2004 Tornado in North-Central Bangladesh: A Case for Introducing Tornado Forecasting and Warning Systems. Retrieved August 22, 2007. ↑ Kelly, Schaefer, McNulty, et al. 1978. An Augmented Tornado Climatology. Monthly Weather Review. Retrieved August 22, 2007. ↑ Tornado: Diurnal patterns. Encyclopædia Britannica Online. Retrieved August 22, 2007. ↑ A. M. Holzer, 2000. Tornado Climatology of Austria. Atmospheric Research. 56:203–211. Retrieved August 22, 2007. ↑ Nikolai Dotzek, 2000. Tornadoes in Germany. Atmospheric Research. Retrieved August 22, 2007. ↑ South African Tornadoes. South African Weather Service. Retrieved August 22, 2007. ↑ Jonathan D. Finch, Ashraf M. Dewan. Bangladesh Tornado Climatology. Retrieved August 22, 2007. ↑ Severe Thunderstorm Warning Service in NSW and the ACT. Australian Government Bureau of Meteorology. Retrieved August 22, 2007. ↑ European Severe Weather Database. European Severe Storms Laboratory. Retrieved August 22, 2007. ↑ TorDACH Homepage. TorDACH. Retrieved August 22, 2007. ↑ Paul M. Markowski, 2002. Hook Echoes and Rear-Flank Downdrafts: A Review. Monthly Weather Review 130(4):852-876. Retrieved August 22, 2007. ↑ Charles A. Doswell, III, Alan R. Moller and Harold E. Brooks. 1999. Storm Spotting and Public Awareness since the First Tornado Forecasts of 1948. Weather and Forecasting 14(4):544-557. Retrieved August 22, 2007. ↑ What is SKYWARN? National Weather Service. Retrieved August 22, 2007. ↑ 59.0 59.1 Tornado Detection at Environment Canada. Environment Canada. Retrieved August 22, 2007. ↑ Skywarn Europe. Retrieved August 22, 2007. ↑ Questions and Answers about Tornadoes. A Severe Weather Primer. National Severe Storms Laboratory. Retrieved August 22, 2007. ↑ Harold E. Brooks, Charles A, Doswell III. 2000. Normalized Damage from Major Tornadoes in the United States: 1890–1999. Retrieved August 22, 2007. ↑ Lee R. Hoxit, Charles F. Chappell. 1975. Tornado Outbreak of April 3–4, 1974; Synoptic Analysis. National Oceanic and Atmospheric Administration. Retrieved August 22, 2007. ↑ Thomas P. Grazulis. 1999. Tornado Oddities. tornadoproject.com. Retrieved August 22, 2007. ↑ Roger Edwards, Tornado Safety. Storm Prediction Center. Retrieved August 22, 2007. ↑ Storm Shelters. National Weather Service, Huntsville Alabama. Retrieved August 22, 2007. ↑ 67.0 67.1 Miller, Doswell, Brooks et al. 1999. Highway Overpasses as Tornado Shelters. National Weather Service, Norman, Oklahoma. Retrieved August 21, 2007. ↑ 68.0 68.1 68.2 Thomas P. Grazulis, 2001. The Tornado: Nature's Ultimate Windstorm. (Norman, OK: University of Oklahoma Press. ISBN 0806132582). ↑ 69.0 69.1 69.2 Myths and Misconceptions about Tornadoes. The Tornado Project. Retrieved August 22, 2007. ↑ Chris Cappella, 2005. Overpasses are tornado death traps. USA Today. Retrieved August 22, 2007. ↑ John Monteverdi, Roger Edwards, Greg Stumpf, Daniel Dudgel. 2006. Tornado, Rockwell Pass, Sequoia National Park, July 7, 2004. Retrieved August 22, 2007. ↑ VORTEX: Unraveling the Secrets. National Severe Storms Laboratory. Retrieved August 22, 2007. ↑ Erik Rasmussen, 2000. Tornado Forecasting. Severe Storms Research by Erik Rasmussen and Collaborators. Retrieved August 22, 2007. Bluestein, Howard B. 1999. Tornado Alley: Monster Storms of the Great Plains. Oxford University Press. ISBN 0195105524. Bradford, Marlene. 2001. Scanning the Skies: A History of Tornado Forecasting. Norman: University of Oklahoma Press. ISBN 0806133023. Grazulis, Thomas P. 1997. Significant Tornadoes Update, 1992–1995. St. Johnsbury, VT: Environmental Films. ISBN 187936204X. __________. 2001. The Tornado: Nature's Ultimate Windstorm. Norman, OK: University of Oklahoma Press. ISBN 0806132582. Hall, Roy S. 2003. Tornadoes. Farmington Hills, MI: Greenhaven Press. ISBN 0737714735. Lyons, Walter A. 1997. The Handy Weather Answer Book. Detroit, MI: Visible Ink press. ISBN 0787610348. All links retrieved December 11, 2015. United States Year to date tornado reports. The Tornado History Project Searchable database of tornadoes overlaid on a Google Map. The Tornado and Storm Research Organisation (United Kingdom). Tornado Detection and Warnings (National Severe Storms Laboratory). Chasing Tornadoes (National Geographic Magazine). Tornado Preparedness Tips for School Administrators (NOAA / SPC). This page was last modified on 11 December 2015, at 17:30.